Today we want to talk about crypto trading, they are becoming very popular and this is a guide for you to get started on your Crypto Investment. Just like the stock market you will soon get involve in using bots that can help you to make 1-2% per day, one percent per day may actually comes back to about 3000 percent per year. 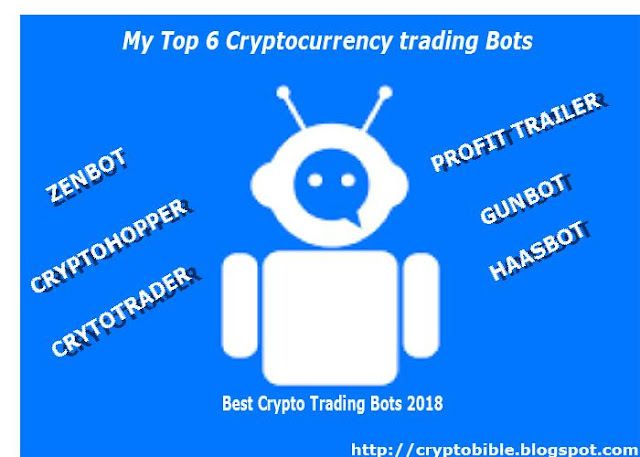 This post is about my personal Top 6 Trading Bots available right now in year 2018 and choosing the best one for you. *Disclaimer* I am not a financial advisor and recommend you do your own research before purchasing/Using any of this Bots. I am not also in any way affiliated or working for them. There are two different Types/Stages of bots you should know, some are better for beginners while some are recommended for more advanced/Experienced users only. The beginner Trading Bots: Just has the name implies this are for people who are just starting up with programming (No experience with coding Needed). Advanced Trading Bots: In other to use this kind of bot you have to understand a little bit of programing (Coding experience). Using a Bot is a must if you want to make a ton of money trading crypto currency. Below are the Best cryptocurrency trading bots for trading bitcoin, ethereum, litecoin or alt coins. Zenbot is an open-source command-line cryptocurrency trading bot using Node.js and MongoDB. You must understand Coding or Programing. Capable of High Frequency Trading. Claim 1.531 ROI in three months. Plugin architecture for implementing exchange support, or writing new strategies. Flexible sampling period and trade frequency - averages 1-2 trades/day with 1h period, 15-50/day with 5m period. Configurable sell stops, buy stops, and (trailing) profit stops. Simulator for Backtesting strategies against historical data. Work on further exchange support is ongoing. For one, they are the only cloud-based cryptocurrency bot on the market, meaning their bot continues trading when the computer is off. Trade cryptocurrencies automatically, 24/7. Even when your computer is off. Trade on technical indicators, or subscribe to a signaler who sends buy signals. Cryptohopper is a powerful companion that trades for you. Check the stats, trade history and charts of all your currencies. Read the forum and share your ideas and opinions about the coins you’re trading in. Cryptotrader is an algorithmic trading platform for Bitcoin and other cryptocurrencies. Our goal is to provide traders with cloud-based automated trading solutions powered by cutting-edge technology. Monthly fees based off on Bitcoin pricing. Automated trading bots in the cloud. Support for all major Bitcoin exchanges. Instant Email alerts & SMS notifications. No software installation required. We rent servers for you. All major crypto-currency exchanges are supported for both backtesting and live trading. Trading strategies can be expensive. One time payment / Lifetime license. Gunbot supports Windows, Mac and Linux. Expensive and not for the beginner (in my opinion). 3 Plans-Beginner, Simple and Advance. 0.035-0.084 every 3 months (Current $525-$1,260). PROFIT TRAILER Is our top 6 cryptocurrency bot with so many positive reviews. This bot is completely different, it is a bot for Everyone, that means both the Beginners and advanced users can make use of it. The most powerful crypto trading bot now with more power.We give you a way to trade with multiple buy and sell strategies at the same time.We’re fast, simple and automatic 24/7. Out of the Box Solution. Add On Changes Settings Based on Market conditions. *Education Optional but suggested (Not necessary). -Wiki with all the details. *VPS Needed ($13 per month). Monitoring Dashboard (Configure Settings from your phone!!!). DCA Log (Dollar Cost Average).